Ashton’s temporary replacement, she’s filling in the rest of the year while a formal replacement is interviewed/etc. Im still taking fanart/guest strip submissions to air during a Break-cation! Date of that is still up in the air, but will say something before it happens. I considered leaving the principal unidentified to see if people freaked out about Ashton being involved. But noped out of that. Friday cliffhanger, with no transcript, only a cryptic message from the Creator, which may be an apology, a warning, foreshadowing , or a politcal comment on the selection of the available candidates running for Mid-Terms. Without more infor or more context or both, it is difficult to say. That’s probably what this is leading into. I’m hoping that at least it doesn’t go the other way. I think that’s spot-on. It would fit in with what Agent Brown said about the “guppies” some time ago. If it were “the other way” (i.e., getting rid of Selkie), then (a) Mina wouldn’t have that pleased expression, and (b) Selkie and Todd would have known about it ahead of time. Point of note– I’m pretty sure that Mina already knows what is going to be said; I’m guessing there was an emergency faculty meeting this morning dealing with it so the teachers can answer questions and be briefed on their part of whatever is going on. Might be real entertaining, especially since Miss Flower was possibly NOT invited to the meeting. “Interim principal” implies she’s a temp. 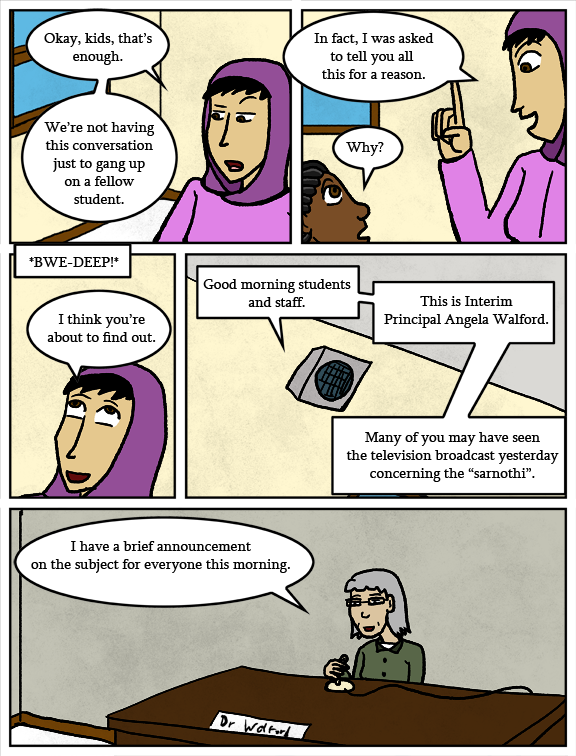 Also, Dave mentions below the comic that she’s serving for the rest of the school year while candidates for a full time replacement are being interviewed. That’s how I’d run a school. That’s an incredibly empty desktop. I guess Angela hasn’t fully settled in to the position yet. AARGH! FRIDAY CLIFFHANGER! YOU FIEND! I wanna see more Sarnothi students!! And maybe some teachers!! Best thing would be having a sarnothi speaker come in for a Q&A with the children. I really hope the staff can help keep Selkie safe. Especially from the other students’ parents. They’re looking at her like she’s a monster. I’m kinda doubting the parents, specifically Truck’s monster ones, will see her as harmless. Especially if a certain speciesist bully’s parents have their way. Probably after the kerfuffle with how he handled the Selkie/Truck issue. I’d assume that’s when it was, but I don’t remember it being specifically mentioned before. He quit when it became obvious he was going to get kicked to the curb. He tried to use it to make Selkie guilty here. To Selkie’s credit, she thought it was great that he could stay home and watch cartoons. She has a pleasant smile, so it can’t be bad.